peaCURE > What is peaCURE? Palmitoylethanolamide (peaCURE), is a fatty acid amide, and is a naturally occurring substance within our bodies. Fatty acid amides are, as the name suggests, an amide formed from a fatty acid and an amine. Amines are a functional group that consist of a nitrogen atom in combination with three carbon atoms and/or hydrogen atoms. Fatty acid amides are vital to the chemical signaling processes within our bodies. Palmitoylethanolamide is produced within our cells, and within the body it contributes to the homeostasis, or balance, of the body. First identified in Czechoslovakia in 1952, palmitoylethanolamide was initially brought to market by the company Spofa in the late ‘60’s. It was introduced using the brand name Impulsin. The same product was introduced to Spain by Almirall under the brand name Palmidrol in 1976. After more than a decade on the market, the product disappeared as the Czechoslovakian manufacturer ceased production. There are many scientific articles about palmitoylethanolamide, which can be found on the medical database Pubmed. Rita Levi-Montalcini, a Nobel Prize winner, found a relationship between palmitoylethanolamide and anandamide during her research throughout the 1990’s. Anandamide, whose name is a derivative of the word Ananda, which means happiness in Sanskrit, is a neurotransmitter. Anandamide is found naturally in the body. This substance is closely associated with the regions of the brain that are responsible important processes. These include happiness, the higher thinking processes, fertility, memory and motor control. Since the initial discovery of palmitoylethanolamide up to 2015, there have been around 500 separate studies on the properties of palmitoylethanolamide for human health. Palmitoylethanolamide is a substance that has gained popularity amongst researchers, clinicians and pharmacologists around the world. So much so that in 2012 the very first palmitoylethanolamide Conference was held. At the event, over 100 researchers from a wide variety of different countries discussed the properties, potential and applications of palmitoylethanolamide. 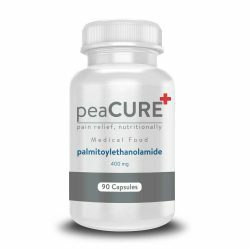 Palmitoylethanolamide (peaCURE) binds to nuclear receptors in cells and produces a variety of effects that help deal with chronic pain and inflammation, nutritionally. The problems occur when the pain is chronic, since our bodies can’t produce enough palmitoylethanolamide. The help comes in the form of capsules containing palmitoylethanolamide as a medical food. This is the perfect way to increase the amount of palmitoylethanolamide in your organism. 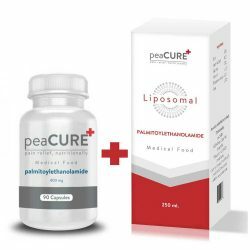 Moreover, since it is basically a fatty acid amide, there is no way to overdose on it and having in mind that it has no side effects. It does take some time for the substance to build up in the body and provide the wanted results. This is why it is very important that you can use it with alongside with other treatment regiments. Palmitoylethanolamide can be found in our bodies as it is a natural compound that can reduce inflammation and pain. Ever since 1980s scientists have known about the anti-inflammatory effects of palmitoylethanolamide. 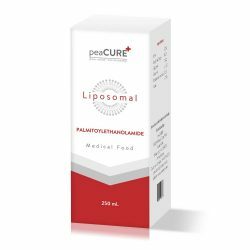 In about two decades before that there had been numerous studies that separated palmitoylethanolamide from other anti-inflammatory methods due to its effects and utter lack of side effects which makes it perfectly suitable for children as well. In early 1990s a Nobel prize winner Rita Levi-Montalcini and her team demonstrated the effects of palmitoylethanolamide on mast cells and their stabilization. The brain uses a lot of energy and it is the place where many free radicals are formed. This can cause serious issues with nerve tissue and palmitoylethanolamide may serve nutritionally as the most natural and effective protection. The same goes for ischemia-reperfusion injury which has been known to occur after a stroke, as well as various acute damages that may affect the central nervous system. Two of the studies were conducted in the military and among workers in the Skoda automobile factory. Another one was conducted in 1997 on 457 school children. All of these studies proved that palmitoylethanolamide helped nutritionally with reducing respiratory system inflammation. However, even more importantly, they showed that using palmitoylethanolamide proactively had positive effects on reducing the chance of becoming sick in the first place. When a person gets in contact with an allergen, their body makes antibodies and these antibodies attach themselves to mast cells. The next time the same person gets in touch with the same allergen, those mast cells release things like histamine and cytokines and they cause the all too familiar allergy symptoms. Moreover, mast cells are present all over the body, so the inflammatory elements can reach a wide variety of places inside our bodies. Palmitoylethanolamide, ingested nutritionally, has been effective when it comes to stabilization of mast cells. Plus it affects mast cells wherever they are, since it can affect places as varying as blood and nerves. Large numbers of studies also showed that using palmitoylethanolamide together with prescribed medication has no bad effects. Palmitoylethanolamide is naturally present in our bodies and it comes with zero side effects, while having great effects for addressing symptoms as well.